A subtropical island famed for its turquoise seas, female divers and golf courses, Jeju has attracted South Korean honeymooners for decades. In recent months, however, the resort island has been receiving a new type of visitor — asylum seekers fleeing the catastrophe in Yemen. “There was no safe place in Yemen for me to hide,” said Mr. Junaid, whose reporting on the Yemen conflict — called “the world’s largest humanitarian crisis” by the United Nations — made him many enemies among the country’s armed groups. He landed on Jeju, off the country’s southern coast, in May, and is still waiting for the South Korean authorities to act on his refugee application. “I heard South Korea was open for Yemenis,” he said. The arrival of hundreds of Yemenis has created a wave of opposition, leading to what is considered South Korea’s first organized anti-asylum movement. “Let’s kick out fake refugees!” people shouted during a rally on June 30 on the island, part of a wave of anti-immigrant fervor sweeping the country, with similar protests on Jeju and elsewhere, including in Seoul, throughout the summer. An online petition asking President Moon Jae-in to stop taking in asylum seekers has drawn more than 714,000 supporters, a record for such a petition. Taken aback, the government of Mr. Moon, himself a son of wartime refugees from North Korea, has vowed to revise the laws to tighten screening of refugee applicants. Jeju’s popularity as a domestic vacation spot has been waning, as South Koreans with rising incomes have begun flying to more far-flung destinations abroad. When AirAsia began running direct budget flights from Kuala Lumpur, Malaysia, to Jeju in December, the island suddenly caught the attention of Yemeni asylum seekers, who saw it as a steppingstone into mainland South Korea because they, too, were exempt from visas. Thousands of Yemenis had fled to Malaysia because of the Muslim connection and because the country did not require tourist visas for them. But they could not stay there more than 90 days and the country would not grant them refugee status, so Jeju beckoned as a safe haven. Mr. Junaid, who arrived on May 29, made it just in time. On June 1, South Korea added Yemen to the list of 11 other countries that need visas to enter Jeju. On April 30, a month before Mr. Junaid showed up, the government had banned the 487 Yemeni asylum seekers still on Jeju from leaving for the mainland while their applications for refugee status were reviewed. Muaadh Galal Mohammed al-Razeqee and his pregnant wife fled Yemen in May and disembarked in Jeju six days later, taking a $150 AirAsia flight for the last leg of the trip from Malaysia. The Red Cross and local groups have pitched in to help the asylum seekers, offering medical assistance, food and blankets, while they await decisions on their applications. Mr. Razeqee and his wife found temporary shelter when an American English teacher agreed to share her apartment. But not all on Jeju have been so welcoming. While the few hundred Yemenis here make up a tiny percentage of the island’s population of 660,000, their presence has generated a lot of concern, even fear. 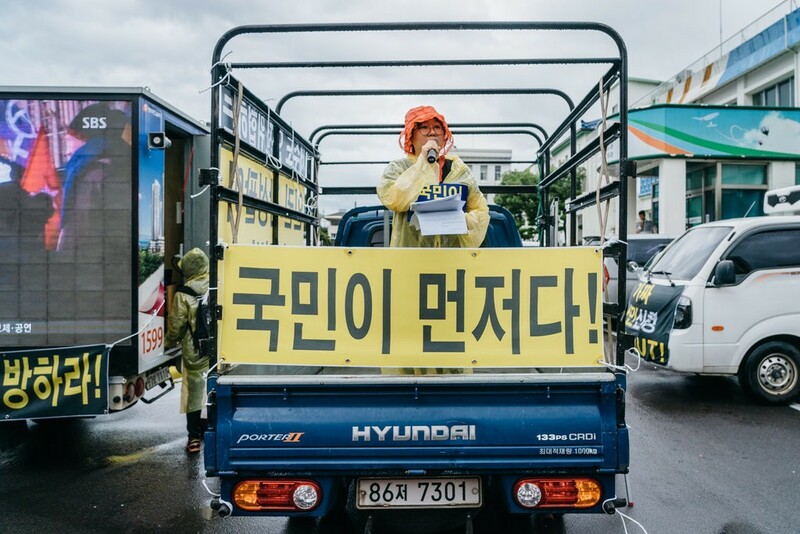 “If these people are safe, why doesn’t the government let them move on to the mainland as they wanted to?” said Kim Jin-yi, 32, who attended the Jeju protest. 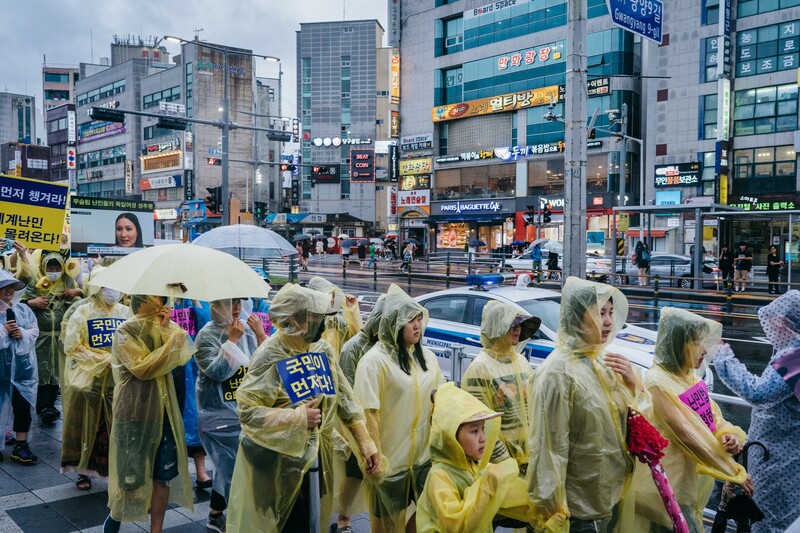 South Korea takes pride in its homogeneous society and has long been averse to accepting asylum seekers. Because of its location, the country has not been a major destination for refugees, aside from those fleeing North Korea, who are generally accepted as compatriots. As the number grows, so does public wariness, with the tensions exacerbated on Jeju since the Yemenis have been confined there. “Who comes first, our own people or refugees?” chanted about 50 protesters, most of them women, who marched in the rain around Jeju City Hall. During the rally, speakers called the asylum seekers potential criminals or illegal migrants stealing jobs. Why should South Korea accept refugees, they asked, when the United States is shutting its borders? 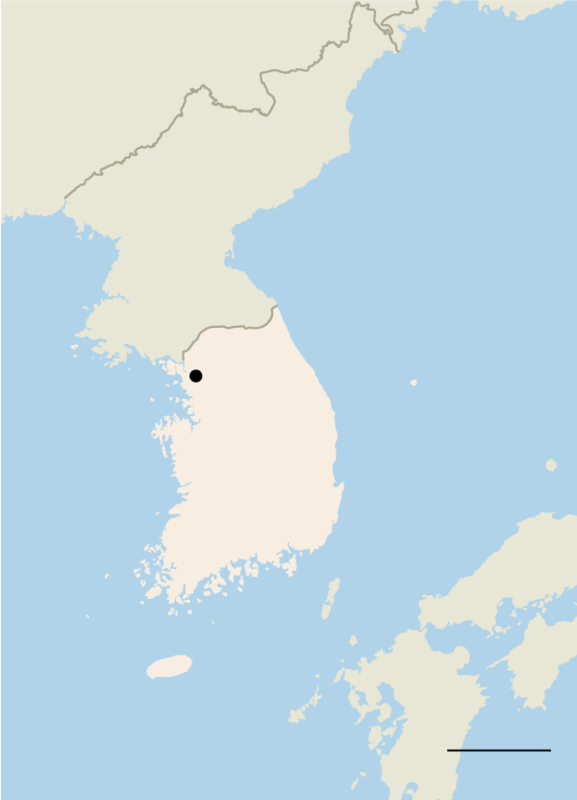 ”If Jeju is breached, South Korea will be breached,” said Oh Mi-jin, 44, who grows cabbage and broccoli on Jeju. She added she was furious the government had left rural people like her — “working alone in the fields” — exposed to the danger she said migrant men posed. 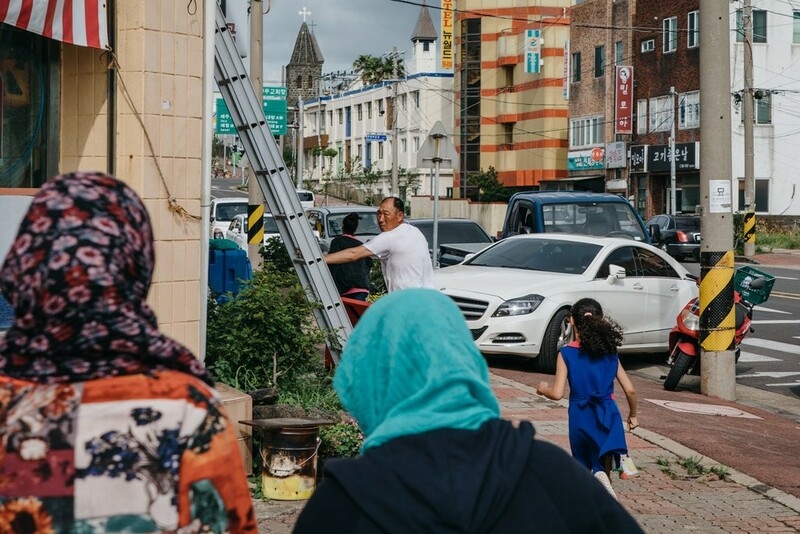 More than 90 percent of Yemeni asylum seekers on Jeju are men. They say they just want a safe place to work, but some islanders said they were so scared of the migrants they were afraid to let their children play outdoors. “When they move in groups, women avoid them,” said Byun Jin-young, 40, a mother of two. On the internet, fearmongers warn in Korean of an invasion of Arab terrorists or rapists. 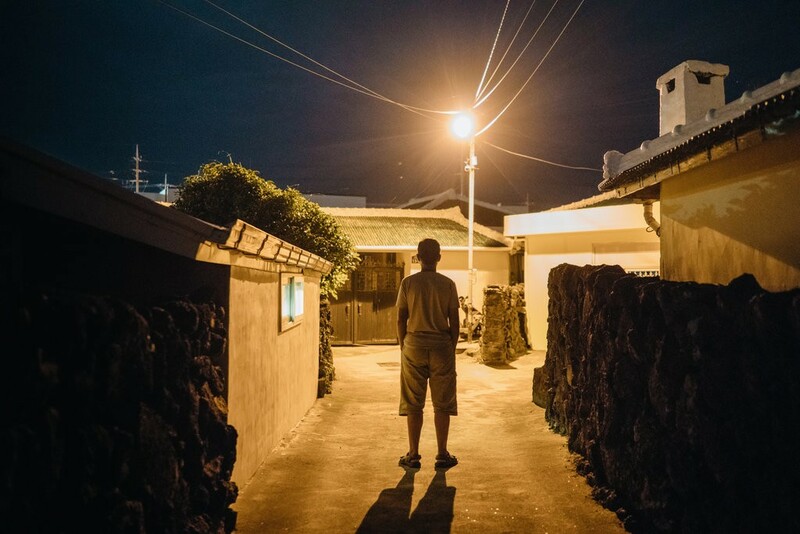 The hundreds of Yemenis left on Jeju feel trapped. Marwan Saeed, 38, a computer engineer from Sana, Yemen’s capital, arrived in late May. He sold his secondhand Hyundai and his wife’s jewelry to raise the money for the trip. After his money ran out, he moved out of a cheap motel room and camped in a tent for 11 days, battling monsoons and mosquitoes. The central government is trying to help the asylum seekers find temporary jobs on fishing boats, at fish farms and in restaurants as they await screening, which can take months. Kim Eun-young, a Jeju native who offers a Korean-language class for several Yemenis, said if any part of South Korea should sympathize with the Yemenis’ plight, it should be Jeju. From the late 1940s through the Korean War, the military, police and right-wing militias massacred thousands of islanders in the name of fighting communists, and many residents, including Ms. Kim’s aunt, fled to Japan as refugees. “They worked hard in Japanese cities like Osaka and sent money to build community halls, pave roads and buy school supplies in their hometowns in Jeju,” Ms. Kim said. The prejudices of locals exasperate many of the Yemenis here. Majid, 28, who asked to be identified only by his first name because he is wanted in Yemen for his atheist activism, defended his home country and its treatment of women.